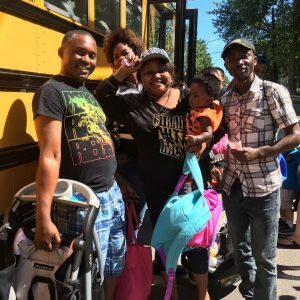 LEWISTON — George Macosso, his wife and their children, along with dozens of others, got on one of four school buses Saturday morning, headed for the beach at Fort Williams in Cape Elizabeth. The trip was free to help underprivileged families get out of the city and experience summer fun at the beach. The family is from Angola. “We’ve been in Maine for eight months,” he said. Without the trip, they would not have been able to go, he said. Zahar Osman and her two children were in line waiting to get on the bus. 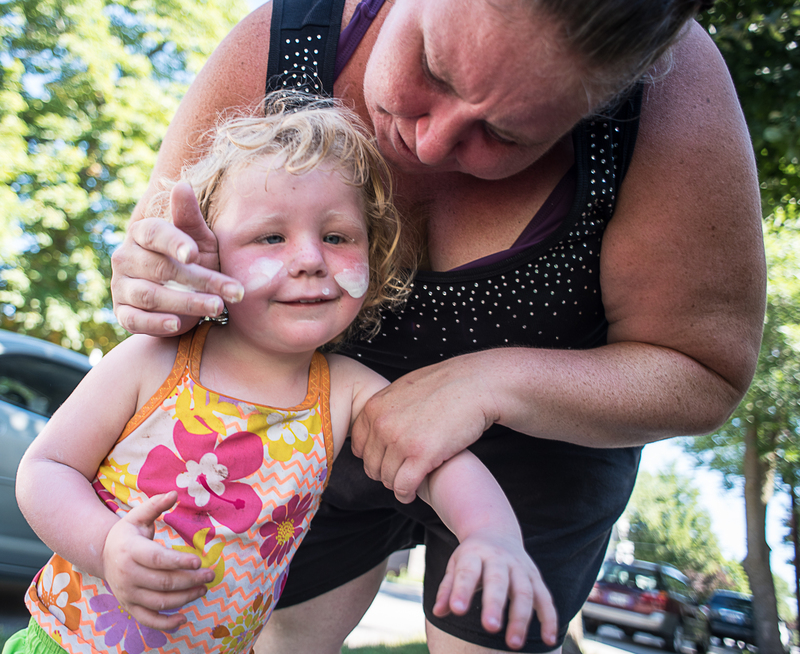 Her little girl was ready to swim, wearing a bathing suit under her clothes. “It’s cold!” she said of the ocean. 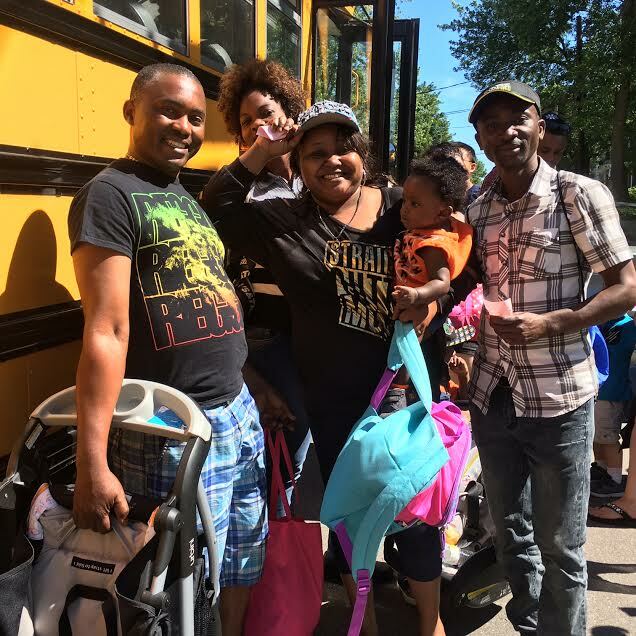 The trip was provided by Hope House and Hudson Bus Lines, which also provides busing for the Lewiston School Department. Both new and longtime families of downtown Lewiston often miss out on Maine’s most scenic spots, said Bruce Wilson, director of the Hope House, a nonprofit organization that provides support for families. Some families don’t have cars, money for gas, and don’t know how to get to Maine’s beautiful sights, Wilson said. They also feel unsure that they’re welcome, he said. Five years ago, he and his wife, Jan, offered to take downtown families to the beach. They filled up their van and arranged carpooling. The next year, they didn’t have room to take everyone who wanted to go. 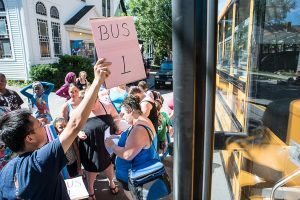 Hope House asked Hudson Bus Lines for one bus and driver. The company agreed. The next summer, Hudson Bus Lines provided a bus for another trip to Range Pond and the Portland Head Light. Word spread. The following summer, twice as many parents and families wanted to go. Wilson asked for two buses. His fourth summer volunteering, Wilson asked for three buses. This year, Wilson said he was reluctant to ask for a fourth bus. But as families signed up, it appeared that four were needed. Hudson Bus Lines said yes “without any hesitation,” Wilson said, praising the company for being so generous. Saturday morning families showed up at the Hope House at 91 College St. to make sandwiches and pack lunches. 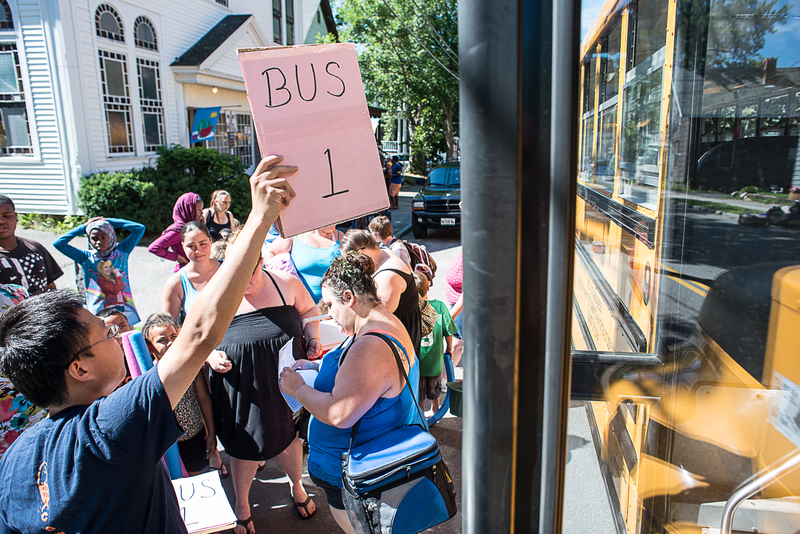 Volunteers from Boston helped coordinate which bus each child or adult boarded. The 24 volunteers were from the Chinese Bible Church of Greater Boston. The Chinese Bible Church volunteers are mostly students and those from different countries who want to be a part of the tradition that brings people from different ethic backgrounds together, Wilson said. Friendships made at the Hope House are growing, as is help from the community, Wilson said. A neighborhood trip to the beach “reminds people that just being neighbors is what it’s all about,” Wilson said.